Here at Selina’s, we have two play areas for children, one inside the café and one in the garden. 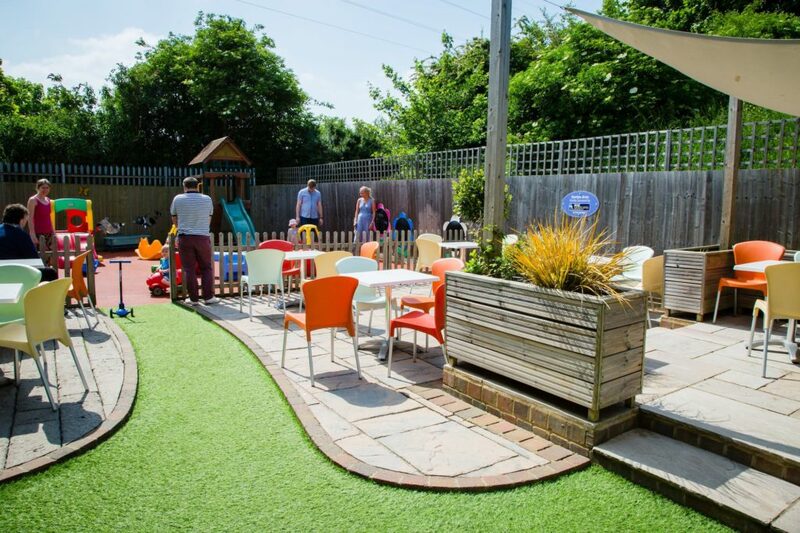 In Selina’s, children are free to roam around the café, into the play areas and out to the garden. Both children’s play areas are secured with gates and fencing to keep your little ones safe and secure. We do request you supervise your children at all times, please. Our indoor soft play area is suitable for children up to five years old. The play area has colourful and durable Wesco indoor play equipment; soft artificial grass covers the floor, and the walls cushioned. To help us keep it clean, remove shoes before entering, and please don’t take food into the play areas. For parents, we have installed a bar around sections of the indoor play area. Parents can watch their children play while enjoying our delicious home-cooked food and cakes- and they can see you! There is a selection of children’s books if you want to find a quiet corner to share a story. The outdoor garden play area has a climbing frame, slides, a playhouse, Wesco outdoor play equipment and scooters which will keep your little ones occupied for hours while you relax. At certain times of the year, the garden is also a sun trap. Local company Rose Landscapes kindly donated the patio and garden area. Both play areas are open during Selina’s regular trading hours. The garden area, weather dependent, is also open all year round. We often find little ones don’t want to go home!